One thing that has surprised me about having a baby is how much longer everything takes. Getting out the door, doing laundry, going to bed, making dinner…. The only things that seem to be happening faster these days are eating, showering, and sleeping. So as much as I love a good complicated recipe, I have been defaulting to quick and easy dishes pretty much every night (that doesn’t end in fast food :/ ). Things that I can throw together in 30 minutes or less are perfect for me. And if the recipe doesn’t dirty a ton of dishes, then it’s really a winner. So when I made the Skillet BBQ Chicken Pasta from Nicole’s new cookbook a few weeks ago, I was in love – and inspired! After making that pasta dish I almost immediately started thinking about making a Buffalo Chicken version. 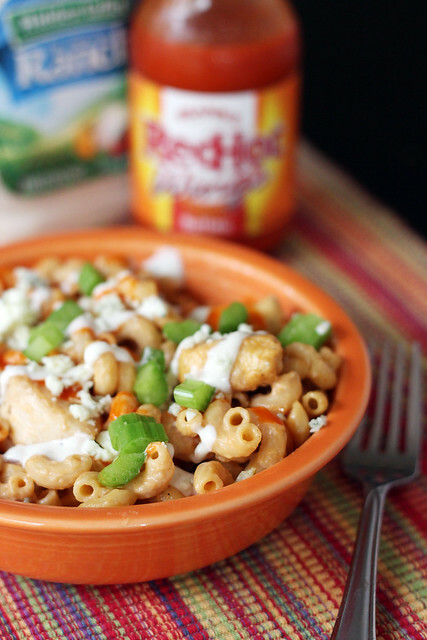 I thought the creamy pasta base would be a perfect match for the spicy Buffalo sauce. 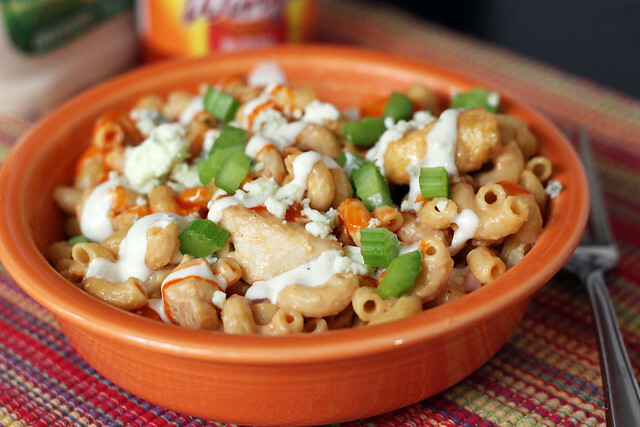 I have made different versions of Buffalo Chicken Mac and Cheese several times, and while they were all amazingly delicious, they were also packed full of fatty calories and more time consuming to make. This pasta is lightened up with the use of Greek yogurt and less cheese and also easier to make! Definitely a new favorite in our house! 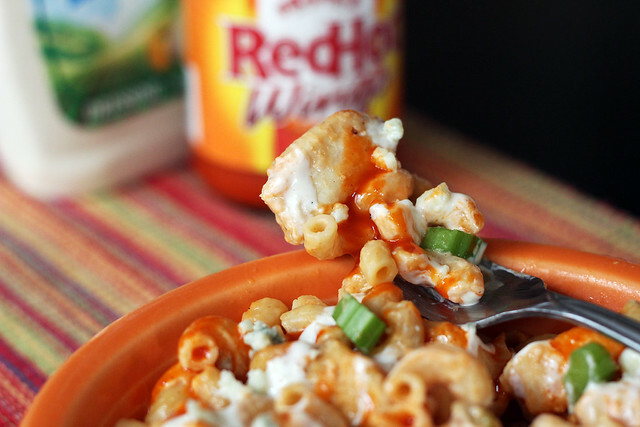 *If you have time you can always try making your own Buffalo sauce! In a tupperware container with a lid, combine the flour and spices. Add the chicken chunks, put the lid on, and shake to coat. Heat the olive oil in a large skillet with a lid over medium-high heat. Add the chicken chunks and cook until the chunks start to turn golden brown. Add the onion and half of the celery. Saute until onions are translucent and chicken is cooked through. Remove the chicken, onions, and celery from the skillet and place on the cutting board you used to dice the vegetables (saves dishes! ), set aside. To the skillet add the water, brother, and pasta. Bring to a boil then reduce heat to medium and simmer for 12-15 minutes, or until most of the liquid is absorbed. Add the Greek yogurt and Buffalo sauce, stir until pasta is evenly coated. Add the reserved chicken, onions, celery and cheese. Stir until the cheese is melted. Serve hot with blue cheese crumbles, ranch dressing, hot sauce, and diced celery. A few more spicy Buffalo ideas!